It would be cool if you could figure out a way to use these,” said She Who Must Be Obeyed, dropping a package of sterile culture tubes on top of my Bouchon cookbook. I was still in the planning stages for her Fifth Annual Birthday Dinner, and now she had made her first — and only — suggestion about the menu. cookbook that I thought would be appropriate, something that looked strange but tasted very familiar. 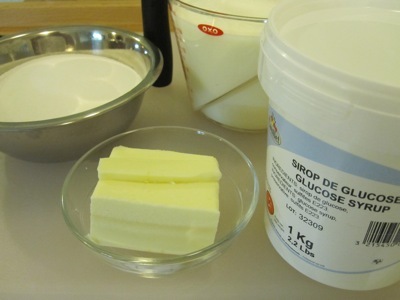 To make the caramel base, I measured out 375 grams of sugar, 350 grams of glucose, 50 grams of heavy cream, and 100 grams of butter. I combined everything in a pan set over medium heat and cooked it until it reached 230 °F. 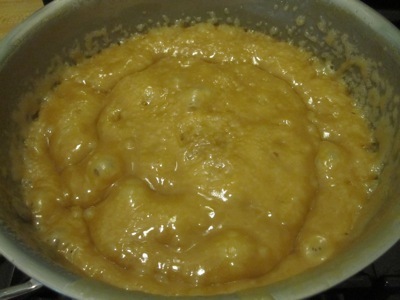 The mixture was at the correct temperature, but clearly not at the caramel stage, so I turned up the heat a bit and eyeballed it until it was the correct color. I poured the liquid napalm (don’t ever get that stuff on your skin!) onto a sheet tray lined with a silicone mat, and let it cool to room temperature. 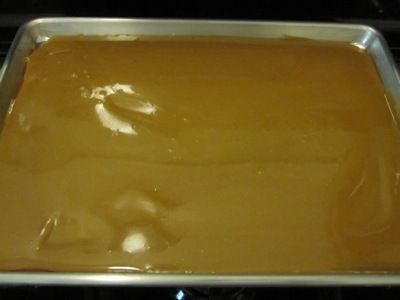 To make the “dry caramel,” I weighed out 210 grams of cooled caramel chunks. 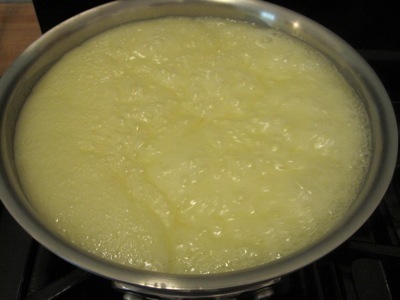 I also weighed out 65 grams of tapioca maltodextrin, which produced another science flashback, this one to my research position at General Foods. 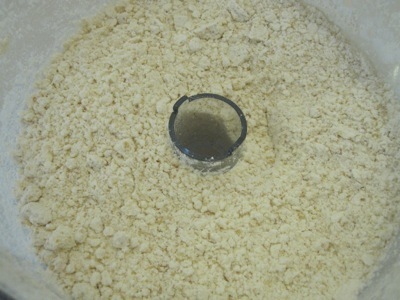 The chemical is a very light fluffy powder that gets everywhere as you try to weigh it out. I also measured out 15 grams of Maldon sea salt. 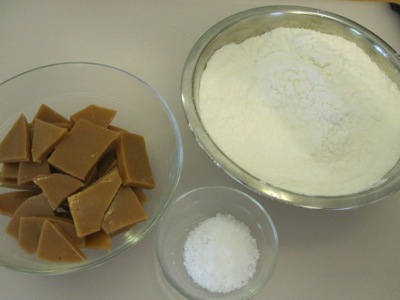 I combined the caramel and maltodextrin in a food processor and whizzed it until the caramel was “completely absorbed” — at least that whet the recipe said. In reality, I still had tiny caramel bits that wouldn’t get any smaller. 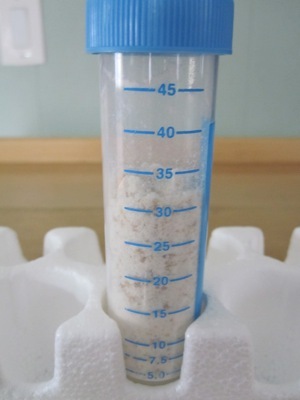 I spooned the powder into a dozen tubes, sprinkled the salt on the top, capped them tightly and returned them to the styrofoam rack in which they were originally packaged. As I offered a tube to each guest, I recommended that they tip the contents into their mouths. How did it taste? The dish is supposed to be served in a glass with a much wider mouth than my tubes, so there was a very concentrated salt hit at the beginning. Once past the salt, however, the powder reacted with the moisture in my mouth and reconstituted what was obviously a very buttery salted caramel. It was a culinary magic trick that made everyone laugh. I still have a container full of unused caramel as well as a pint of the caramel powder. Now I need some new unsuspecting guests. The look of surprise and confusion on most faces was fun but when that first drop of powder hit their tongues – they became believers. It was a wonderful treat! I will totally volunteer to be an unsuspecting guest, whenever you need to get rid of some of that stuff. Because holyshit, yum! I DID give you some of that stuff, you had it after the pork belly & confit diner I fed you the weekend you moved out.